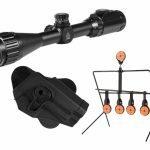 Whether you are using your airgun for hunting or just target practice, there are certain accessories that are must-have items. Here are the top necessary airgun accessories you need in your collection. When looking at necessary airgun accessories, a holster is one of the most debated ones, but still worth mentioning as a frontrunner. If you are using a rifle style airgun, a holster may not be necessary. In fact, many rifle users prefer to go holster free with a rifle to have faster access to their weapon. Another reason a rifle may not need a holster is because select models come equipped with a strap to allow you to carry it without a holster. For the pistol style airgun, a holster is a must have item to ensure your gun is safely stored and ready to use when needed. While there may be some debate on holsters, the use of targets isnt usually open to much debate. One of the most necessary airgun accessories, targets allow you to practice your precision and accuracy. Whether you use your gun for a more affordable way to train in place of a higher priced ammunition firearm, or you use it for small game hunting or vermin control, being able to make the shot is crucial and target practice is the best way to hone this skill. The type of target will depend on the type of ammo your weapon uses. For instance, BB ammo should never be used with metal targets since they can ricochet. Luckily, paper targets are affordable and can be used with pretty much any ammo type. When working with a rifle, having a scope is a great asset for any shooter. Scopes can help you with matters such as magnification, field of view, night vision for low to no light visibility scenarios, and other pertinent aspects to help you get the shot. While most rifles come with a scope of some sort, you can also choose to upgrade the scope later on to fit your exact needs or preferences. Your airgun needs to be stored properly for several reasons. Since most air rifles are made with metal compartments, they can be vulnerable to the elements, especially moisture which causes rust. With a case, you can protect your airgun from damages while also making it easier to transport for trips to the field or range. A case also allows you to ensure the airgun so it doesnt end up in untrained hands. While the capacity of airguns in terms of power and endurance has certainly come a long way in recent decades, it is always a good idea to have a backup cartridge. If you are out plinking or hunting, running out of CO2 can put an end to the operation of your airgun. Most airgunners carry a few backup cartridges on their shooting kit to make sure this scenario is avoided. When looking for a way to work on making long-range shots or stealth shots, a bi-pod is nonnegotiable. This accessory lets you mount your air rifle to help with steadiness to ensure even the most difficult shot can be a successful mark. While they are great for training for tactical professionals looking to perfect their skills, they are also useful for the small game hunter alike.